Pius XII instituted this feast day in 1954 in response to the unanimous traditional belief in the Mother of the King of King and Lord of Lords as Queen. All graces come to us through the intercession of the Blessed Mother, the most accessible ruler of all. 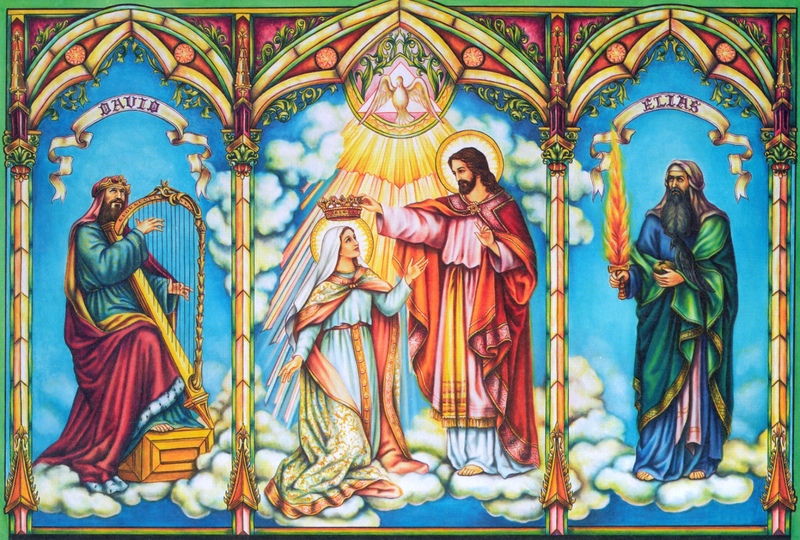 Her coronation as Queen of all Creation is intimately connected to her Assumption into heaven. We contemplate this wonderful scene in the Fifth Glorious Mystery of the Holy Rosary. The Mother of Christ is glorified as as ‘Queen of the Universe’. She who called herself the ‘handmaid of the Lord’ at the Annunciation remained faithful to what this names expresses throughout her earthly life. In this she confirmed that she was a true ‘disciple’ of Christ, who strongly emphasized that his mission was one of service: The Son of Man ‘came not to be served, but to serve, and to give his life as a ransom for many’ (Matt 20:28). In this way Mary became the first of those who, ‘serving Christ also in others, with humility and patience lead their brothers and sisters to that King to serve whom is to reign’ (Lumen genitium, 36), and she fully achieves that ‘state of royal freedom’ proper to Christ’s disciples: To serve Christ is to reign with Him… Her ‘glory in serving’ is completely compatible with her royal exatation. Taken up into Heaven, she does not cease her service for the sake of our salavation. The dogma of the Assumption which we celebrated last week leads in a natural way to the feast we celebrate today, the Queenship of Mary. Our Lady departed for heaven to be crowned by the Blessed Trinity as Queen of all Creation: The Immaculate Virgin, preserved free from all guilt of original sin, on the completion of her earthly sojourn, was taken up body and soul into heavenly glory, and exalted by the Lord as Queen of the universe, that she might be the more fully conformed to her Son, the ‘Lord of Lords’ (Rev 19: 16), and the conqueror of sin and death. (Second Vatican Council, Lumen gentium, 59). It has been quite popular to bestow Queenship on Mary through the custom of canonically crowning her images, with the express approval of the Popes. 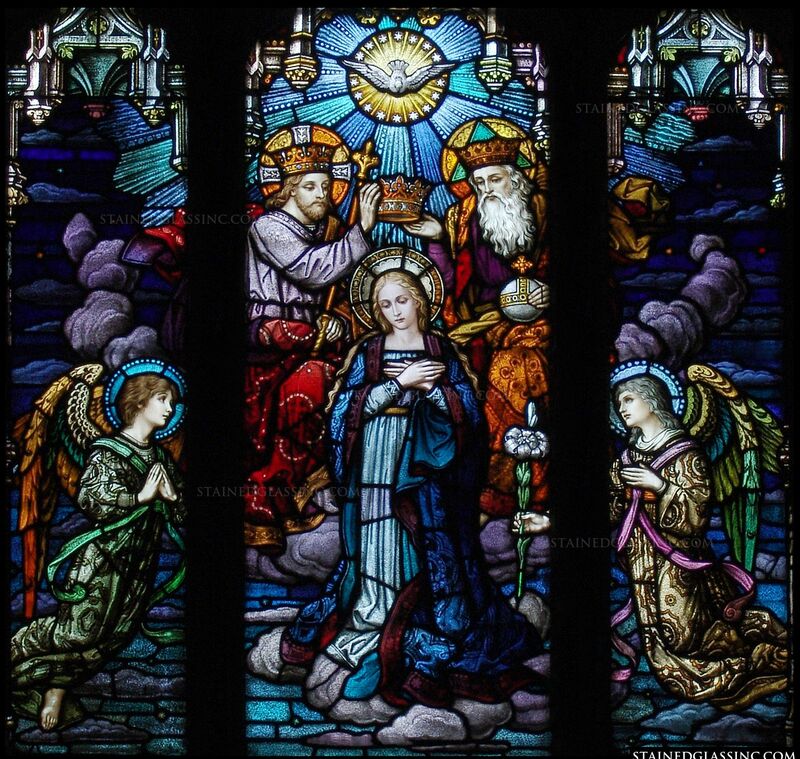 Since the first centuries of Chrsitian art has represented Mary as Queen and Empresss, surrounded by angels and seated on a royal throne, with all the accoutrements of such majesty. Sometiems, she is shown being crowned by her Son. The faithful have long had recourse to her as Queen through popular prayers like the Salve Regina, the Ave Regina Caelorum, and the Regina Coeli. Frequently we have sought her protection, reminding her of this beautiful roayl epithet. We have pondered it in the Fifth Glorious Mystery of the Holy Rosary. Today, in our prayer and throughout the day, we will do so in a special way: You are all Fair, and without blemish. You are a garden enclosed, my sister, my Bride, an enclosed garden, a sealed fountain. ‘Veni: coronaberis…Come: You shall be crowned’ (Song of Songs 4:7, 12; 8). If you and I had been able, we too would have made her Queen and Lady of all creation. A great sign appeared in heaven: A woman with a crown of twelve stars upon her head, adorned with the sun, and with the moon at her feet (Rev 12:1). Mary, Virgin without stain, has made up for the fall of Eve: And she has crushed the head of hell’s serpent with her immaculate hell. Daughter of God, Mother of God, Spouse of God…The Father, the Son and the Holy Spirit crown her as the rightful Empress of the Universe. And the angels pay her homage as her subjects…and the patriarchs and prophets and Apostles…and the martyrs and confessors and virgins and all the saintas…and all sinners, and you and I. Gave a link in today's post.